As I mentioned at the end of my last post, I enjoyed my first few days in Taipei, but I didn't feel like there was enough to do to occupy all four of my days in Taiwan. So, for days three and four, I ventured out of the city for some day trips to the surrounding areas. My online research prior to this trip had suggested places like Taroko Gorge or Taichung as options, but these were quite a bit further away and would be long, fairly tiring days by my reckoning. Taking public transport that much in a foreign country is also quite daunting (she writes after spending the last hour trying to figure out trains and public transport in Japan) so I went for the slightly easier, and more relaxed options. Now, I say relaxed, but I actually started the first day trip pretty early, to allow enough time for the various trains and buses I'd be catching, in case I got lost or anything went wrong at any point. For this first day, I was heading to Shifen, followed by Jiufen, as both are in the same direction out of Taipei, and neither requires a full day to itself. To reach Shifen, I got a train there from Taipei Main Station, changing lines at Ruifang - the ticket woman told me this when I bought my ticket from her, but I'd looked up the train times and route the day before too, as often trains only have their final destination listed on departure boards, which may not be where you are going! This also proved to be helpful when I discovered that the trains between Ruifang and Shifen are only once an hour. Once I was on the right train though, it was all fine, the layout inside being similar to the subway, and the stations were listed above the doors. They weren't listed on the second train, nor announced, so I had to keep an eye out the window for platform signs, and I knew that Shifen is the fourth stop from Ruifang. Arriving in Shifen is quite an experience, as the train drives right up through the middle of town, and everyone has to flee the train tracks that they were standing on just minutes ago. Which, of course, also meant that after getting off the train, I found myself wandering along those very same tracks. The most popular activity here is releasing lanterns; they're made from huge pieces of cloth, so the actual lantern is as tall as some people, and you can write on it and decorate it before release. I didn't do one myself, as it was a little pricey for one person, and not something I wanted to do alone really. I was quite content to amble down the rail tracks though, and take photos as other people released theirs - though they sometimes had to scramble off the tracks while taking their photos, to allow the train past! 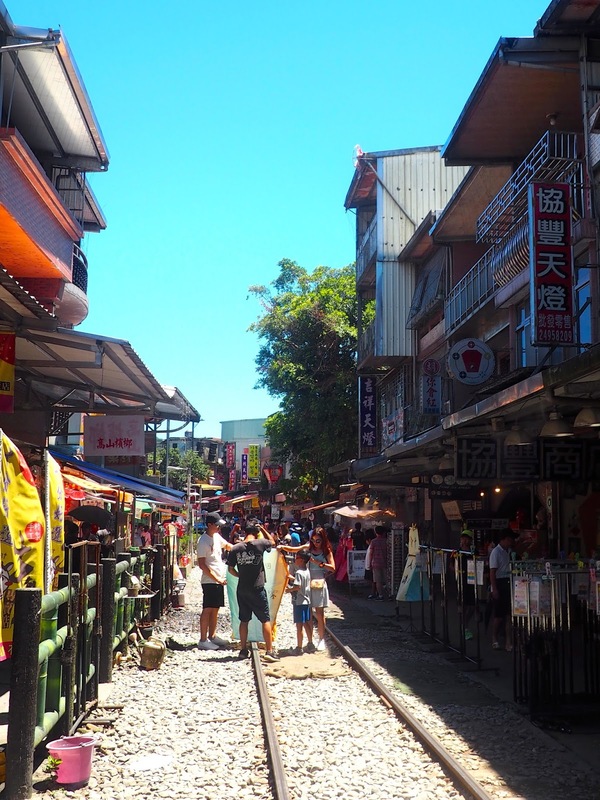 There were plenty other shops selling souvenirs, food and drinks, pretty much all aimed at the tourists, but with the old buildings, floating lanterns, and railway straight through the middle, it still made for a quite a picturesque scene. I followed the Old Street as it led me out of town, following the signs for Shifen Waterfall Park. 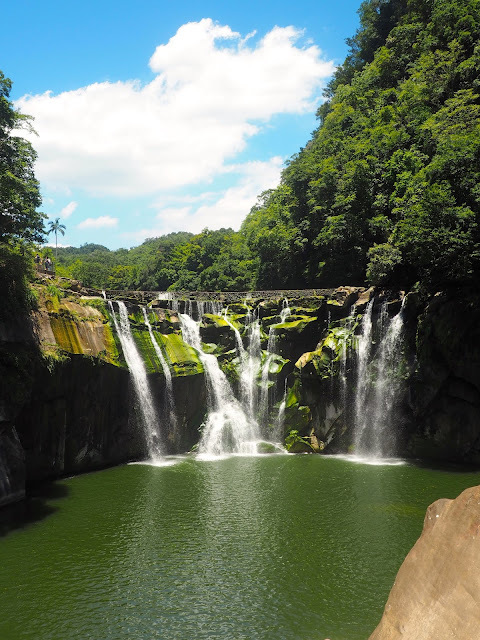 There are other waterfalls in the area, as far as I know, but just the one in this park, and it's the widest one in Taiwan, which is why it's so popular. And it was certainly fairly busy that day! Not heaving to the point where I was going to get annoyed, but busy enough, not to mention very hot and sunny - fortunately I remembered sun cream this time, but I've yet to remember to wear my hat at any point. The park is about 15 minutes outside the town, but then you have to walk another 15-20 to reach the actual waterfall. There's a circular route within the park, although it's hard to tell from the signs, and I actually ended up doing it in two halves and turning back each time, only realising they met in the middle after reaching the falls again from the second half - doh! In my defence, I was avoiding the hectic food stalls at the top of the waterfall, and didn't realise the path continued on past them. I took the path to the right at first, which led up through the forest, all along a wooden path - there were a few stairs along the way, which only felt strenuous because of the heat. However, when the stairs eventually lead downhill again, it's to offer the best view of the waterfall, straight across from its drop pool. Sure, it's not the biggest waterfall ever, but it's still suitable pretty and impressive, especially in the sunlight. The path winds alongside the pool, taking you to the top of the falls, for a close up view. I didn't linger too long, as I was there were people posing for photos everywhere I turned, and it was getting a little too hectic. At this point, I took the route that rejoined the path I'd started on - turns out if I'd continued past the food stalls, I'd have finished the loop. I was glad I explored that side afterwards though, as here there are two suspension bridges to cross, one of which runs alongside the railway. No trains passed by while I was on the bridge, but I'd already passed it on the train myself, when arriving in Shifen. I returned to Shifen Old Street after that, watching more lanterns being released, and stopping to refuel myself (mostly with caffeine!) along the way. The trains from Shifen to Ruifang are only about once per hour, so I didn't hang around for too long, as I knew the next one was coming fairly soon. I bought my ticket at the counter in the tiny station and waited on the platform. From there, I was heading to Jiufen, which meant catching a bus from Ruifang. I left the train station (there are signs for the exit for Jiufen) and walked up the street to the left for about 10 minutes, until I found the bus stop next to the police station. Most of the bus information was in Chinese, but there was a big sign indicating which services go to Jiufen, and I paid the bus in cash (NTD 15) when disembarking. I didn't realise that Jiufen was so far uphill until that bus ride, when the ocean suddenly opened up on the left side (I was sitting on the right, damnit! ), and we wound higher and higher up the hillside. 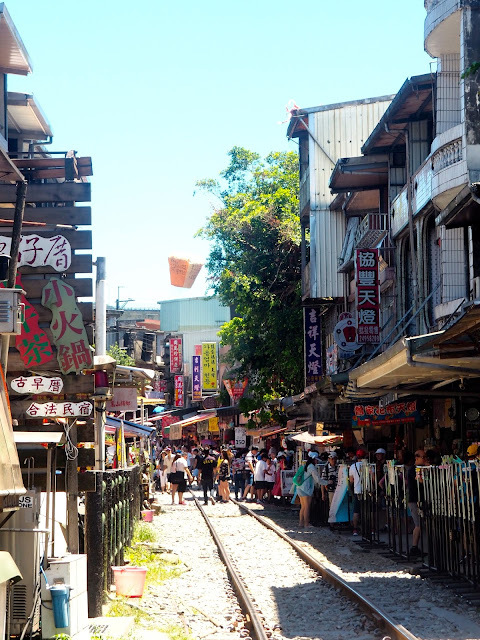 Jiufen is very popular with Japanese tourists in particular, though you'll find all nationalities visiting, because the Old Street here served as inspiration for the setting of the movie 'Spirited Away'. I've never seen the movie myself (I probably will eventually, but it's never seemed like my sort of thing), but I'd seen images online to understand the resemblance. 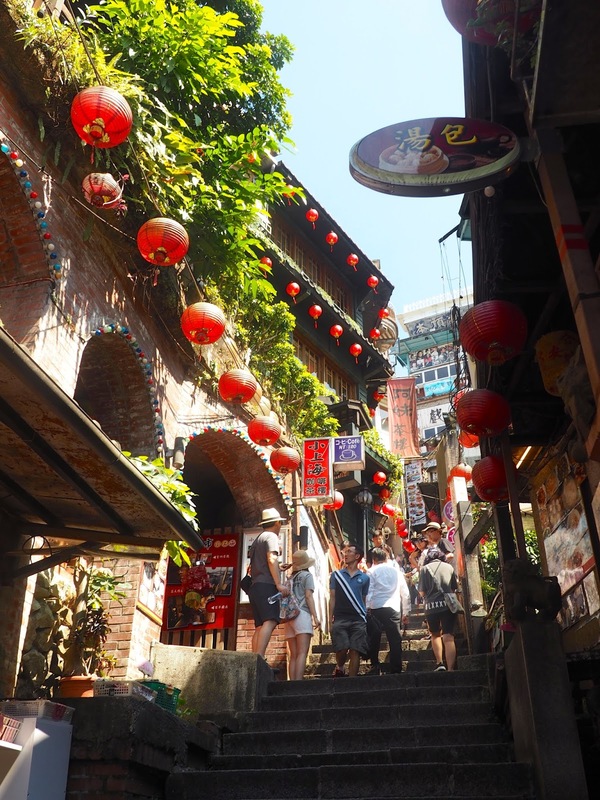 To be honest though, I didn't really get the appeal of Jiufen, bar a few photo locations. It was too hot and too busy, which is a sure-fire recipe to make me grumpy really fast. The streets are narrow, so they get crowded quickly, and every shop was either food or souvenirs, which all seemed pretty similar to other places I've been. The covered path with lanterns suspended from the roof was pretty, but it was hard to take any good photos with the number of people around! The best spot is when you follow the main street for a while, there's a crossroads with stairs running across it - head down and you'll find the most recognisable locations from the movie, which is where I got my better photos (though still with other people in the way much of the time). I'd been considering stopping for food somewhere, but I wasn't really hungry, and it was just so busy, so I ended up leaving earlier than initially planned. It was nice enough, but I just didn't really get why it was so popular (apart from the movie of course), but perhaps I've seen too many similar places around Asia - I hope I'm not getting jaded already! I caught a bus directly back to Taipei (you have to walk up a street from where the bus drops you off) which cost NTD 99 and took about an hour, dropping me off in the city centre again. Although I was back earlier than planned, it had still been a fairly tiring day, and with an early start, so I took the evening to relax! I'd planned to start this day fairly early too, but I hit snooze a few too many times, and didn't get up until late morning. 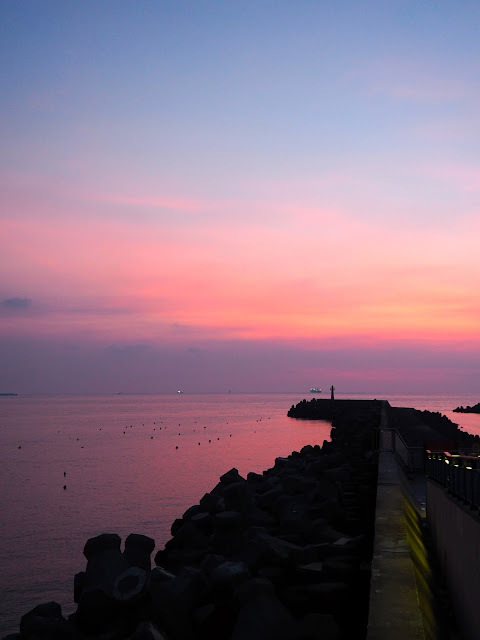 This actually worked in my favour though, as I was heading to Yehliu Geopark, followed by Tamsui, and when deciding to get up early, I'd completely forgotten that sunset is the best time to visit Tamsui, so my schedule actually worked out pretty well. Yehliu can only be reached by bus, and despite directions from online, it did take me a while to find the right bus station! Taipei's main bus station is next to the train station, but for Yehliu you need to go across the road (or out exit M2) to the KuoKuang station, from which you take bus 1815. I paid cash as I got on, but the woman at the ticket counter inside the station (why is there a ticket counter when you pay on the bus?) was kind enough to break a note to provide me the correct change (NTD 96). It was a big, comfortable coach, and each stop is announced in advance, as well as displayed at the front, so it was easy to ring the bell when we approached Yehliu. From the stop, it was a 15 minute or so walk through the village, past the harbour, to the geopark. My biggest qualm when first approaching was the noise! There's an Oceanarium next door, and I could the noise of the animal show taking place, as well as the construction work going on. Fortunately, this was pretty much only audible around the entrance of the geopark, and when I continued further on, away from the oceanarium, it was much quieter. 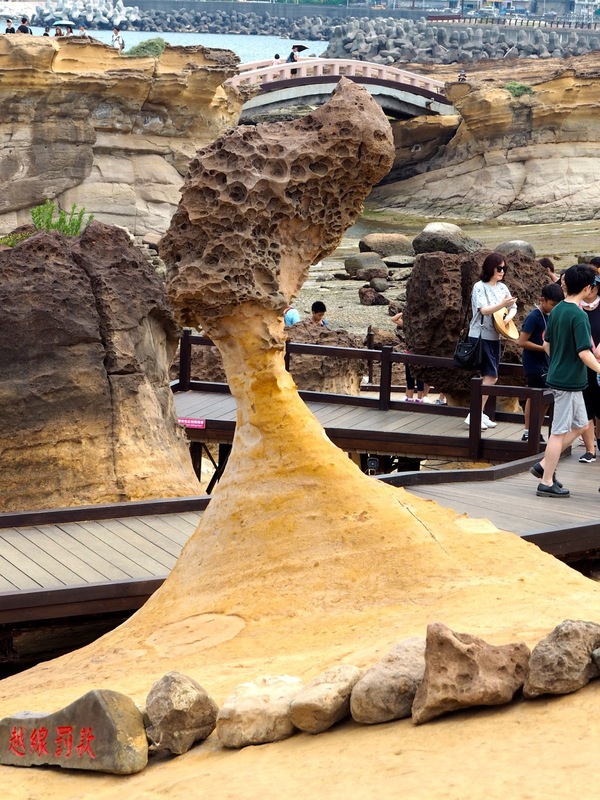 The geopark was plenty busy too - I really shouldn't be surprised, since it's summer - so there's people populating nearly all my photos, but at least here there was more space to move around (unlike the cramped streets of Jiufen yesterday). The park is on the coast, and I do love being by the sea at any chance I get, and the points of interest are the mushroom like rock formations popping up out of the ground. The most notable one is called the Queen's Head, due to its resemblance to a royal profile, but weathering is causing her neck to get progressively thinner, so there's also a replica now near the park entrance. Other formations have names describing their likenesses, but the head is definitely the most obvious. It was still nice to just roam around the rocks for a while - though I could have done with more of a breeze especially being by the coast! I did climb the small hill in the middle of the park, which not many others seemed to be venturing up. The path along the top of the hill was much, much longer than expected, especially in the heat (I will keep moaning about the heat and the sweat all summer, get used to it!). I think there was a viewpoint towards the ocean at the end, but I looped back when I reached the lighthouse. There wasn't too much to see, just the ocean beyond the foliage, but it was nice to get a few moments of peace, as there only a handful of other people taking that part of the route. When I came back down, I veered off the marked path and wandered amongst the rocks themselves, trying not to walk through too many people's photos, though after living in Hong Kong, I've sort of given up with that, since I do it all the time, both accidentally and on purpose. There were also some cool views of the pathway to be had, since it's built on striated rocks, with little bridges spanning water inlets. I explored the back portion of the park too, which was less busy than the main area, and climbed the stairs up to the viewpoint looking over the whole park. I think my visit here lasted around an hour and a bit in total, before I started winding back out the park, and up the hill towards the bus stop again. Here's where my plans got a bit skewed! I'd intended to take bus 862 directly to Tamsui - it takes between 1.5 and 2 hours, but it would be the same by any other route - and was sat waiting at the stop, when a local came to ask if I knew where I was going and such. I explained I was going to Tamsui and he started telling me to take a different bus or go to Keelung, since the 862 takes a long time. And while he was pointing out stuff for me on the (Chinese only) bus signs, the 862 went whizzing past because I was distracted and didn't flag it down! I know he meant well, but this was pretty frustrating, since the next bus was anywhere from 30-50 minutes away. I waited a while longer, before eventually catching the 1815 back to Taipei, and getting off at the first MRT station we passed, as I figured it'd be quicker that way in the end, than waiting that long for the next 862 bus. I took the red line of the MRT all the way to end, reaching Tamsui late in the afternoon, as the sun was starting to get low. Fisherman's Wharf is the best place to watch the sunset from, but since I still had a good hour or so until the proper sunset, I decided to walk there, as it would take roughly the same amount of time. 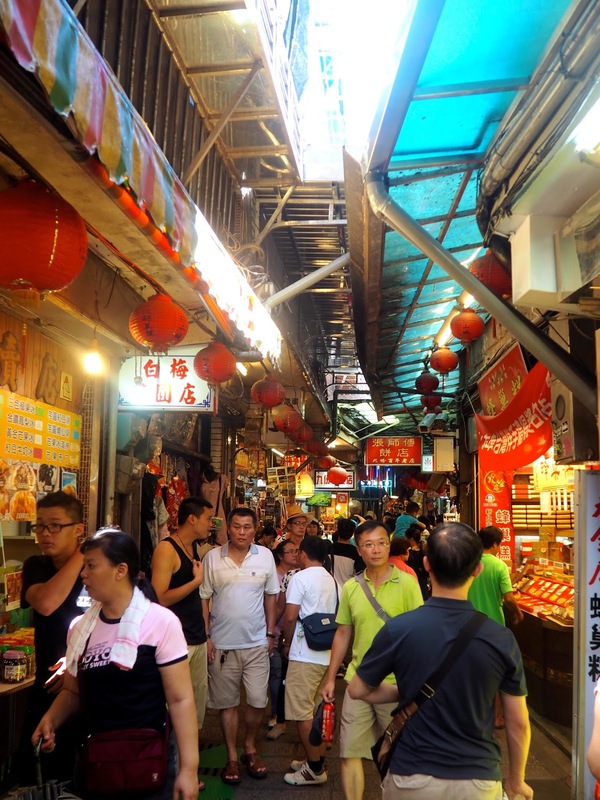 I started on Tamsui Old Street, but that seemed to be a fairly standard shopping street, so I veered a street over, to follow the coastline, and was pleased to discover some more interesting sights by the waterfront. There were lots of street food stalls, mostly selling seafood, and various buskers dotted along the pedestrianised street. This also meant I already had a view of the sun setting, not obscured by buildings, and could keep snapping photos as I made my way towards it. I ended up following the cycling path all the way up, though there were plenty other pedestrians on it too. The sun had set by the time I reached Fisherman's Wharf, but I'd got some good views on my walk up anyway, and the sky was still painted in an array of colourful hues. 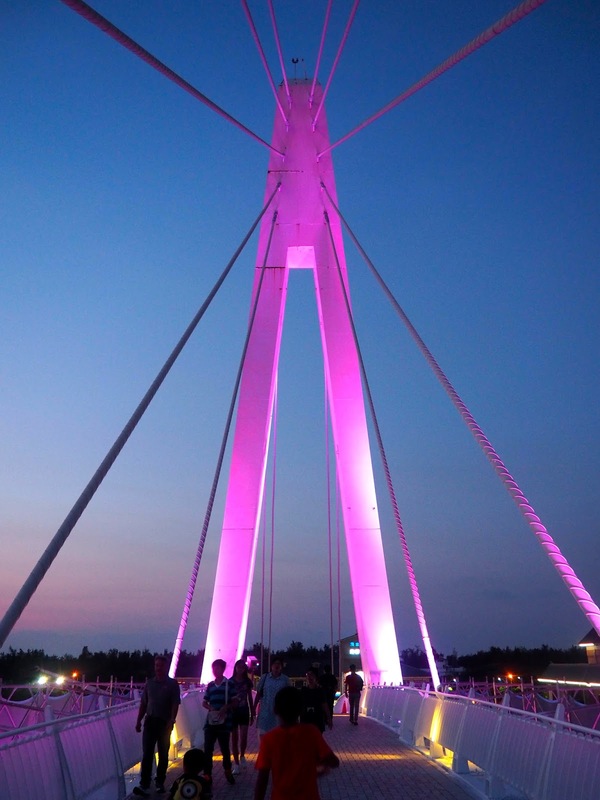 Lover's Bridge is a popular sight here, with its distinct shape lit up in rainbow colours against the night sky. I walked all the way along the top of the wharf, taking my time to admire the skies above me, with planes occasionally visible, flying off into the night. I crossed Lover's Bridge itself - not really sure where the name comes from? - as it changed colour around me. It would have been another hour or so to walk back to the MRT, and by this point, I was pretty exhausted from my whole day! Instead, I found the nearest bus stop, and was soon able to catch the bus back to the MRT (clearly signed on its front), and from there it was about a 40 minute ride back to my hotel. And then the next morning, I was up and packed, and back off to the airport again! 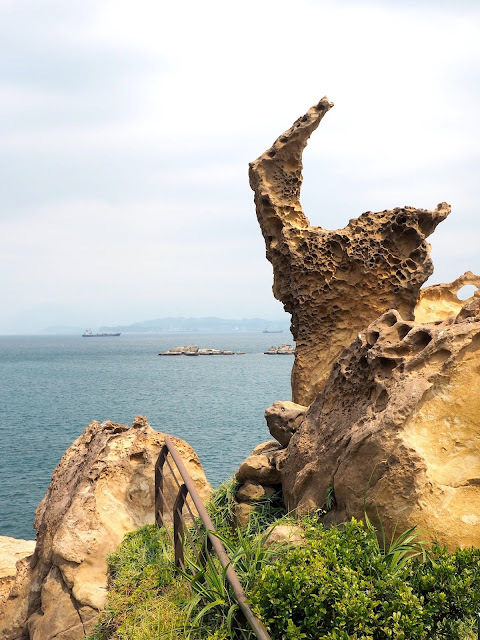 If I ever get the chance to go back to Taiwan, I'd love to explore some other parts of the country, but I felt my four full days (five nights) gave me a pretty good experience overall. I was glad to have some time in the city of Taipei, and also to have enough time for those day trips, to see beyond just the one city. Taiwan is also one of the friendliest countries I've visited, with not one person seeming even vaguely annoyed when I didn't understand or had to question something. When I didn't know how much the bus from Jiufen back to Taipei cost, the driver patiently asked where I was going, while the woman sitting behind him was indicating the number with her fingers! It helped that there was a good level of English from most people, but that level of patience and willingness to help - even the guy at the bus stop, who had the best of intentions despite making me miss the bus - isn't something I've come across as universally in other places. Here's hoping Japan is just as good! Nice read. Interesting, we have the same observation regarding Yeliu and Danshui. I do love the dried seafood in Yeliu, I think that was the memorable thing for me while I was there.